Wake Up, Rosetta! 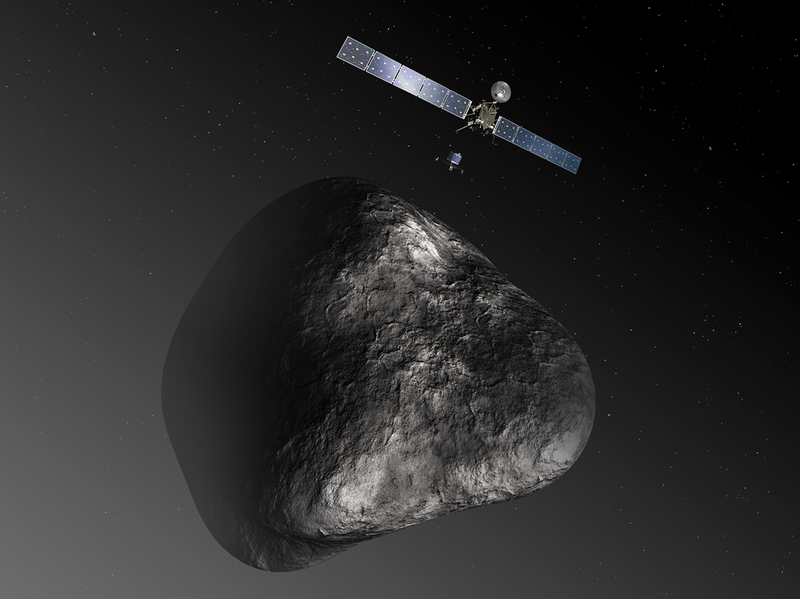 Europeans Begin Checklist For Comet Landing : The Two-Way The European Space Agency's probe has spent the last decade doing flybys of Earth and Mars to match comet 67P/Churyumov-Gerasimenko's speed. Rosetta and Philae in an artist's rendition of the spacecraft's comet encounter. The European Space Agency's Rosetta probe, launched in March 2004, will be awakened from a deep sleep next month in preparation for a rendezvous with comet 67P/Churyumov-Gerasimenko, which will culminate late next year with the first-ever soft landing on such a body. The 6,600-pound spacecraft, which has spent nearly a decade making repeated flybys of Earth and Mars to gain enough speed to catch the comet, was put in hibernation in July 2011, after its last major gravity-assist maneuver. Rosetta's wake up call is set for Jan. 20, 2014 at precisely 1000 GMT (5 a.m. EST). The ESA is marking the event next month with a competition, inviting the public to share "a video clip of you shouting 'Wake up, Rosetta!'" You can upload the video to ESA's dedicated Facebook page. The Washington Post says NASA's Deep Impact mission, which fired a projectile at a comet in 2005 in hopes of analyzing the debris, was "just a drive-by" compared to the ESA's efforts. "[European] Scientists hope that by flying Rosetta alongside the comet and sending down a barrel-size lander to collect and analyze samples, they will get an even better idea of what comets are made of and what role they played in the formation of our solar system." In August, Rosetta will pull up alongside 67P/Churyumov-Gerasimenko and on Nov. 11, 2014, is set to place its robotic lander, called Philae (after an island in the Nile River) on the comet's surface. The Post says the proposed feat has been variously described as either parachuting onto a mountaintop or leaping from one speeding car to another. "Scientists hope the comet images and data collected by the $1.4 billion Rosetta probe will help them piece together the early history of our solar system since comets are among the most primitive objects in our cosmic neighborhood. By searching for organic molecules on the comet's surface, Rosetta also could help scientists examine the possibility that space rocks planted the seeds of life on Earth, researchers said."